Dealer celebrations are fairly common. 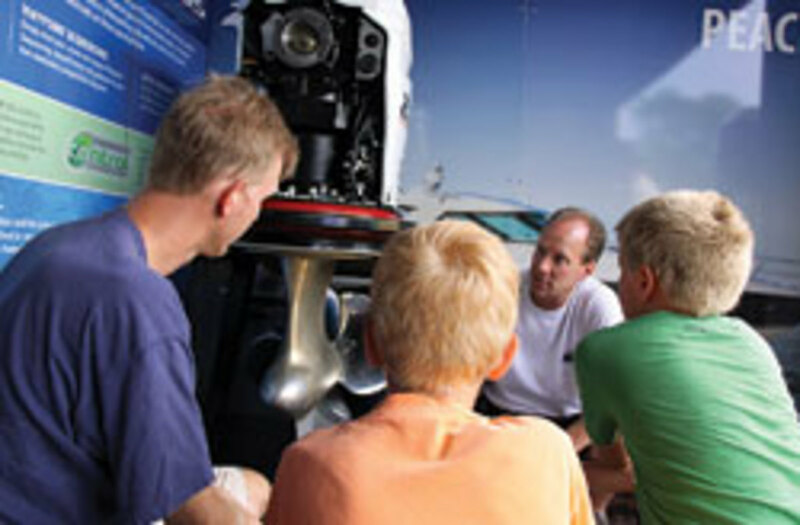 They bring customers together, make them feel pampered and get people excited about boats. However, they don’t usually include Coast Guard helicopters performing rescue demonstrations. But not all dealerships are Nauset Marine, which celebrates its 50th anniversary this year. The longtime Boston Whaler outlet — a brand it has represented for nearly all of its half-century in business — has grown, with three locations on Cape Cod, Mass. Coast Guard helicopters weren’t the only attraction at Nauset’s 50th anniversary party in July. 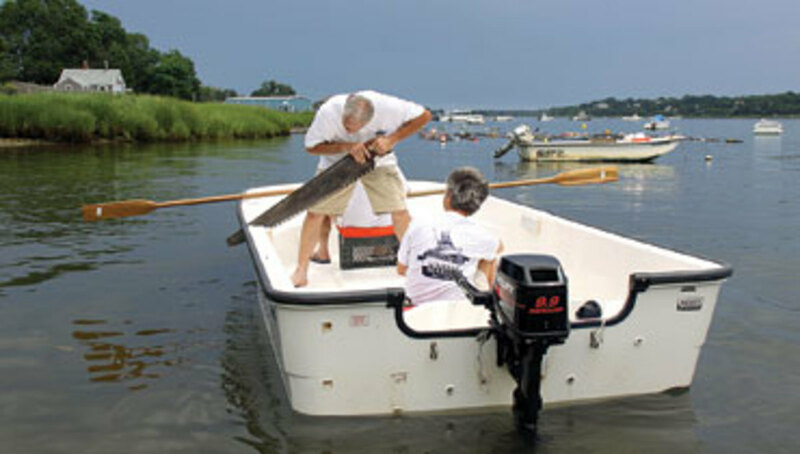 The dealership sawed a Boston Whaler in half, re-enacting one of the marine industry’s most memorable photo ops, and raffled off a 2011 15-foot Montauk. The celebration raised more than $40,000 for 32 local non-profits. “We’re eating the overhead; this is all for charity,” Nauset CEO Dawson Farber III says. 10:15 a.m.: A police officer is directing traffic in and out of the event, and stopping traffic on Cape Cod’s busy Route 6A for pedestrians who have parked in the overflow lot across the street. It’s early and it’s already jumping. Farber has saved a nice spot for me and I’m grateful since I will be toting a big camera. It’s hot, but we’re fortunate to get a nice cloud cover and a bit of a breeze coming off Town Cove in Orleans, Mass. 10:30 a.m.: I’m perusing the tents, which are filled with displays from local non-profits. Organizations range from the Orleans Pond Coalition, a group dedicated to keeping the area’s saltwater estuaries and lakes and ponds clean, to Pleasant Bay Community Sailing, whose volunteers tell me Nauset has donated three boats to the organization. The Orleans Gallery Association is also there. Farber is a friend of the arts. His wife, who had worked for the Rowley Gallery, encouraged him to fill unused space in the sales office by hanging some original local artists’ pieces. 11:05 a.m.: Boston Whaler president Tim Schiek, Ron Berman, vice president, product development and engineering at the Brunswick Boat Group, and Boston Whaler regional sales manager Doug Nettles stand next to the boats for sale in the yard, chatting with potential customers. A man approaches and asks about a 1980 Whaler Rampage he’s considering buying on Craigslist. He’s curious as to whether there were any issues with that model year. Nettles gives his business card to the man and tells him to e-mail the model year to him so he can do the research. 11:15 a.m.: A crowd begins to gather around Ed Daly of the Orleans Citizen Forum. Daly is repeatedly dropped into the dunk tank as people buy three balls for $5 for their chance to soak him. Next in line is Hap Farrell, a Rock Harbor Charters captain. The dunk tank doesn’t look so bad; it’s really hot. All day, local figures take their turns. Despite the heat I buy a second $3 cup of clam chowder donated by Land Ho! restaurant in Orleans because it’s that good. 12:03 p.m.: Nauset Marine vice president David Deschamps, the youngest son of one of the dealership’s co-founders, coaches a nervous-looking Wolf on how to navigate his half of the boat with oars and where to sit. 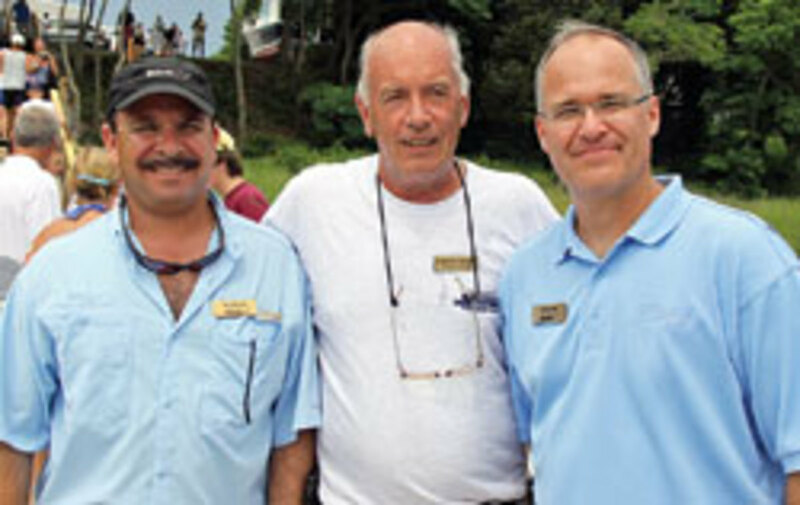 (Nauset Auto and Marine was started by Peter Walker, his father, Howard, and his brother-in-law Phil Deschamps in 1961.) Farber instructs Peake on steering her powered half. 12:05 p.m.: Deschamps, who also heads the custom-building part of the business, goes through the motions of sawing the Whaler in half, and the two parts drift away from each other. After a moment, Wolf and Peake realize they are fully able to steer their halves and will avoid getting soaked. “I’ve got the green version!” Wolf quips to Peake as he rows the bow past her motorized portion. 1:45 p.m.: Dark skies threaten, and some visitors take cover in the sales office or shop. Lines form as customers find accessories. Others stay outside and browse the boat inventory. The Cape Cod Symphony’s Dixieland Trio plays under a tent while people gather with umbrellas to listen. 2:15 p.m.: People stroll down to the dock, anticipating the Coast Guard helicopter rescue demos, but the chopper is delayed by lightning. 3:15 p.m.: The skies have cleared, and some of the lucky media members get to ride out on a Hurricane to watch the rescues from the water. The Coast Guard helicopter finally arrives and we get a perfect view of the two rescue demonstrations. First, a person goes into the water from the side of the helicopter and is rescued in a basket. Next, a second person goes into the water, and a rescuer is lowered to carry that “victim” back up. About 150 spectators look on from the pier, which is bedecked with red balloons. 3:45 p.m.: Orleans police detective Kevin Higgins draws a big crowd at the dunk tank. He heckles the people throwing balls and gets dunked plenty. It’s even hotter out now, and I’m contemplating volunteering to be the next dunkee. 4:05 p.m.: Farber announces that the goal has been to raise $20,000 for local charities. The event brings in slightly more than $40,000. “It’s really nice of them to share the wealth,” says Pat Taylor, a woman selling raffle tickets for a custom wooden kayak to benefit the Cape Cod Habitat. Many non-profits have struggled in the recession, and Nauset is doing more than its part to help out. In August, the dealership will throw a whale-watching event, in tandem with Dolphin Fleet Whale Watching, to benefit the Coastal Studies center. 4:30 p.m.: Alas, I have to return to what Cape Codders call “the mainland,” but not before a dip in the ocean and a quick stop at Land Ho for some tuna sashimi, clams and a beer.